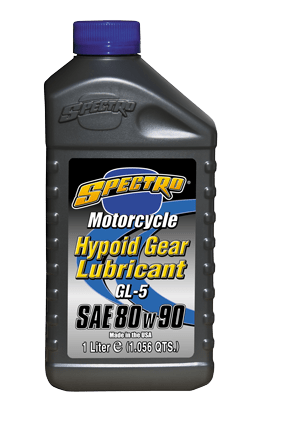 Spectro Hypoid is formulated with the highest density and highest V.I. petroleum base stocks available, then special EP additives are included to reduce pinion gear wear. This fine product is designed for the final drives and transmissions of all shaft drive motorcycles that do not have a wet clutch, including BMW®, MotoGuzzi®, older Harleys®, Big Twins. It reduces drag, friction losses, wear, and extends component life. API GL-5 rated.